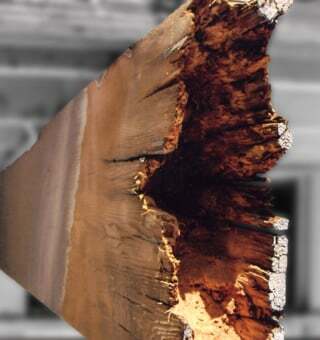 Dry rot oftentimes 'hides' inside an otherwise healthy-looking beam. You gaze up at their simple beauty every day—yet never actually see what's rotten lurking right before your eyes: dry rot and water damage! The architecture of mid-century modern makes it easy for your home's exterior horizontal beams to get exposed to the elements. The beams project out to or beyond the roof-edge framing, and their degree of vulnerability depends on the home's orientation to the sun and its amount of exposure to rough weather, and how well the beams are maintained. A lack of regular maintenance guarantees deterioration over time. Eichlers are impacted mostly in outside atriums and carports, while Streng homes are hit in their overhangs. Decades of exposure wear away paint, leaving beams open to cracking, dry rot, and termites. 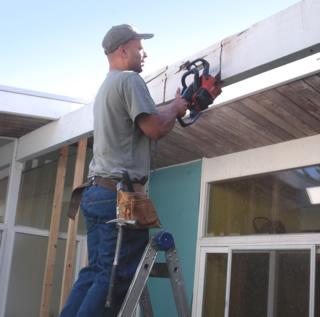 "Those beams get beat up, getting exposed to the sun, the wind, and the rain," says Frank Larson, owner of Larco Construction Services, who's worked on Eichler beams in the East Bay for more than 20 years. "With a 60-year-old house, this is not a new problem—you are just now noticing it." Dry rot is the weakening of wood caused by fungus, which digests the parts of the wood that give it strength and rigidity. It all starts with excessive moisture. Moisture can attract termites, which can eat and destroy a beam quickly, breaking down its structural integrity. The above photo and the two below are from the Randall-Klinck Eichler beam project in Concord. Here, the atrium beam shows a long, exposed crack and surrounding rot. When beams rot, you have two possible maintenance options: repair or replace. For Emily Randall and Mason Klinck, owners of a 1965 Eichler in Concord, their rotting beams meant bringing in a professional to do both. The couple called on RC Construction, based in the East Bay, which repaired a partially exposed beam at the front of the Randall-Klinck house and then replaced the atrium beam. Raymond Campbell of RC Construction cuts out a beam section in need of replacement. "For us, it was a real squeaker—a real nail-biting process—watching our contractor [replace our beam], because the beam was so close to the panes of glass," Randall recalls. "But we knew that they did good work." Sometimes beam damage is obvious, and other times it can take a considerable amount of detective work, because layers of fillers and paints can mask the damage. If you haven't maintained or inspected your beams in a while, it may be time to call in a licensed contractor. But before taking that step, there are telltale signs pointing to damage that you should look for yourself. Same beam after completed repair. On Strengs, the calling cards for damaged overhanging beams are crumbling or warped beam-ends—both signs of advanced decay. Peeling paint, caulking that has separated from the wood, and the presence of mildew or fungus can also indicate moisture problems. On Eichler beams, check for wood that is pushing downward, and for beam undersides that balloon out. When a beam looks like it coves in, it could be a sign of dry rot or termites. "Dry rot is a slow-developing issue, and people can get immune to it," Larson says. When you see a crack or an indentation, they are warning signs that issues are developing. You have to get in there, Larson says, "and clean it out to see how deep the erosion is." "You can get up there, and take something sharp, and poke it," says Joe Gomes, owner of Joe Gomes Construction, which specializes in Sacramento-area Streng homes. "If the wood looks like it's sucked in, then there is rot on the inside, and there is probably water leaking into it from the top."